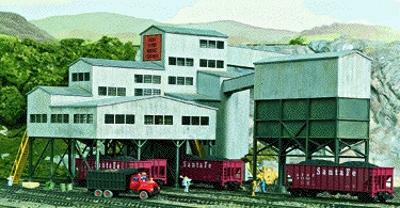 This is the N Scale New River Mining Company - Kit - Main Bldg- 7-1/2 x 5-3/8 x 5-5/8'' from Walthers. Retail $49.98 SAVE 16% ! as always walther&apos;s has another winner with this kit. good heavy and solid casting&apos;s make for a strong build. part&apos;s are clear, sharp and straight as an arrow. you just can&apos;t go wrong with these cornerstone kit&apos;s. they build up easy and look great. well worth the price. this kit alone will add 3 track&apos;s of switching activity to your layout. plus truck traffic and an interesting scene of a busy industry. a few well placed light&apos;s and this will make an awesome night time scene. i recommend all the cornerstone kits i have built to any railroader out there.it&apos;s really hard to find any issues with them. Coal is a big part of the nations rail traffic, and most of it is loaded from mines like this. Based on an actual building, kit is complete with main building, conveyors, colorful decals and much more.